The eldritch secrets of Munchkin Cthluhu deserve a special hiding place! 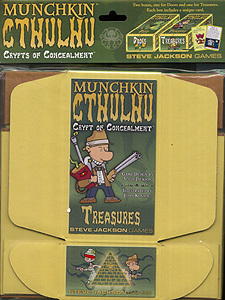 The Munchkin Cthulhu Crypts of Concealment are sturdy cardboard, sized to hold 500 Munchkin cards apiece. One is labelled doors, and one is for treasures. Bonus: Two new Munchkin Cthulhu cards that are unique to this set.